ca CA.pemThe ca parameter specify a file (in PEM format), that contains the X.509 Certification Authority with which the server certificate has been signed. 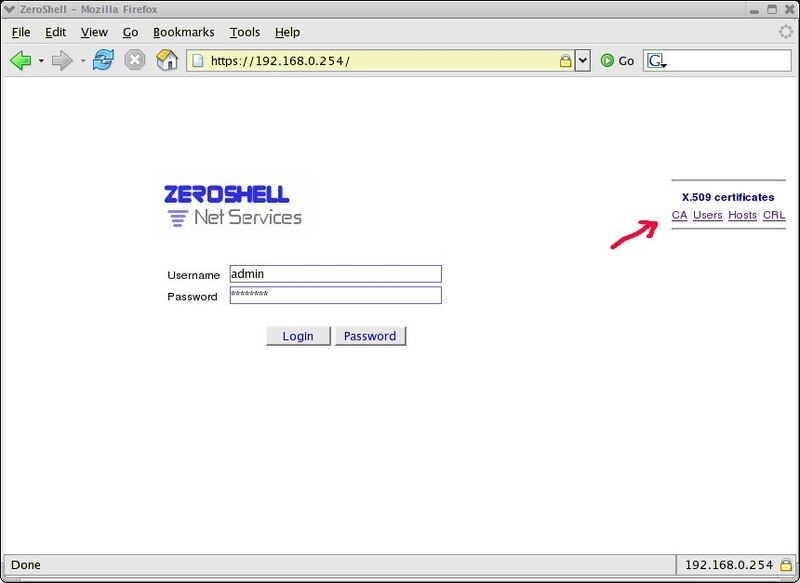 To get the CA’s X.509 certificate, you only need to click on the CA hyperlink in the Zeroshell’s login page. If you save the CA’s certificate with the name CA.pem in the same directory of the configuration file, the you do not need to change the parameter. Otherwise, you must specify the absolute path of the file. Start with the installation. Select the default options and confirm the installation of the TAP-Win32 Adapter V8 device (it is a Virtual Ethernet interface used by OpenVPN). Change the current directory to /etc/openvpn/ and exec (with root privileges) the command:openvpn –config zeroshell.ovpnAt this point, you are requested for the Username and the Password (look at the Note *). If the client is authenticated against the server, the VPN connection is established. make installBecause the files will be written below the system directory /usr, the last command must be executed with root privileges.